Choosing an upholstery fabric can be a daunting task, given that some of the important factors you need to consider can be pretty technical as well as the fact that you have to choose from a wide range of fabrics you may not know much about. However, as upholstery fabric is the most visible and functional part of your upholstery furniture, you wouldn’t want to get it wrong. So here’s some great advice right from the experts about choosing the best upholstery fabric for your upholstery pieces. Upholstery fabric is not only something that makes up the overall appearance of your upholstery furniture, but also what takes the most beating and shows wear and signs of damage. This makes it important to go with a more durable fabric, especially for the upholstery pieces that have a much higher level of everyday use and wear than the others. And when it comes to that, there’s probably no metric more important than “double-rub.” As weird as the name may sound, it actually represents a complex process that helps accurately determine the level of durability of a fabric. Simply put, double-rub is a process that involves a machine rubbing a pad over a piece of fabric back and forth, until the point the fabric is worn out, for testing purposes. The process gets its name from the practice of rubbing a pad over the same piece of fabric back and forth, with each back-and-forth rub being called a double rub. The standard fabrics for domestic use generally come with a double-rub score of 25,000 double-rubs, meaning that if you go with something that’s over 50,000 double-rubs, it’s likely going to last you a very, very long time. As for commercial fabrics, the double-rubs typically turn out to be as high as 100,000 to 250,000 double-rubs. In other words, these fabrics tend to wear out when subjected to a wear amount that’s equivalent to 100,000 to 250,000 double-rubs. You may find our Sewing Dictionary useful! What is the best upholstery fabric (in terms of durability)? It really depends on your use. Generally speaking, the best upholstery fabric for pets would likely be the ones with a relatively higher double-rubs score for domestic use. This is because in houses with a pet, the upholstery fabric tends to receive a lot more wear than the ones without any pets. This is especially true when it comes to dogs, as they have a habit of chewing on the upholstery fabrics, which may make them wear out faster. So if you’re after the best upholstery fabric for dogs, you will want to look for a double-rubs score of at least 53,000 or higher. Usually barkcloth fabric has this. On the other hand, if you have no pets and are looking for a fabric for one of your upholstery pieces that doesn’t receive much traffic, then you would be just fine even with something that has a much lower double-rubs score. So for example, the best upholstery fabric for dining room chairs, sofa, couches and even sewing machine chairs could well be something with just about 40,000 double-rubs, and it would still not wear out for a really long period of time. Finally, it’s important to note that it’s generally not possible to determine how durable a fabric would be until it has been tested. It basically gives you an idea of the production costs of the fabric, but has nothing to do with the durability or even quality of the fabric. However, in most cases, you would find that higher production costs often translate to a better quality. Some of the things the grade typically depends on include the characteristics of the fabric, its weaving details, the overall construction and the fiber content. Many products would have their grade mentioned as a number while the others as some letters. You may want to contact the manufacturer about the grade measurement if you’re having a hard time figuring it out yourself. This often turns out to be the most important factor to consider. While there are many different types of both natural and man-made fibers out there, they vary greatly when it comes to looks, durability, how difficult (or easy) they are to sew on, maintenance requirements and other important factors. The natural fibers like silk and wool typically tend to be the most aesthetically appealing options and sometimes more easy to work with on a sewing machine, but they can be pretty disappointing on the durability front. While they may look beautiful, they can’t stand as much wear and tear as the man-made ones. Silk, in particular, is something you would want to avoid, as it’s very hard to care for and can wear out surprisingly fast even with a moderate amount of use. It needs protection to make it last longer as well as should not be subjected to natural light. The man-made fibers, however, are often made using processes that make them much more capable of withstanding the daily wear and tear and abuse. That said, you don’t have to choose either one or the other. There’s usually also an option to get the best of both worlds by going for something that’s a combination of a natural fiber and a man-made fiber. But again, you would still want to avoid silk as it may just not be worth all the maintenance hassle. These “combination” fabrics may turn out to be the best bet for upholstery pieces like couches as well as wear the best on pieces like a sofa. The ones that have a higher percentage of man-made fabric would be a better option when it comes to reupholstering a couch, and most high-traffic upholstery in general. Finally, you may also want to keep in mind that a simple way to increase the life of your upholstery fabric is to use a good upholstery fabric cleaner. The best upholstery fabric cleaner doesn’t necessarily have to be expensive, but simply something that does its job well without subjecting the fabric to loads of chemicals. 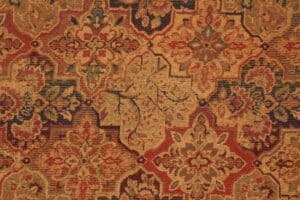 We recommend purchasing your upholstery fabric at Amazon.com or Fabric.com. They have the widest selection of affordable, quality upholstery fabric.